Here in the town where I live, it is often not possible to get Barron's at the only store in town which carries it (a local distribution matter I believe). So while the new edition did not come until today (last week's never came at all), well I can now pass along my remarks. Mish has an excellent blog, he cranks out 2 - 3 pieces per day. I read almost everything he writes, and he is clearly knowledgeable. I highly recommend his blog to everyone. Mish is now calling a top in stocks, we are at least "close enough" so that he sees this as "the top". He has a record (see his article) for calling the top in housing as well. But, let me examine some more of Andrew Bary's piece on my own. Bary brings in experts to cite that because of the low yields in bonds, caution by burned investors (2008 - 2009) and the popularity of alternative investments (private equity, real estate, commodities) that stocks have been neglected. He cites some interesting examples, such as Yale University (and other big university endowments) and pension funds are light on stocks, Yale has only 6% of its portfolio in US stocks (14% total equities, including foreign stocks). Bary notes that hedge fund managers UNDERPERFORMED the S&P 500 by some 10% (ha ha ha!) in 2012. Are hedge fund managers worth that 2% + 20%? And after 2012, the S&P 500 is up over 6% THIS YEAR. He brings in professional investor commentators (Jim Paulsen, Jason Trennert and Stephen Auth) who make the case for a rising stock market. Bary also presents table that shows while this bull run from 2009 HAS been pretty good, there have been OTHER bull markets that have beaten this in the past 50 years. Well, yes there have been other bull markets that have beaten this one on the past 50 years, THREE of them. Bary writes "bullishly" (not specifically recommending the following, but coming pretty close) about ExxonMobil (ticker XOM), Chevron (CVX), JPMorgan Chase (JPM), Citigroup (C), MetLife (MET), Wells Fargo (WFC), Microsoft (MSFT), Cisco Systems (CSCO) and Intel (INTC) among large cap companies. He likes the two oil companies based on prospects for higher oil prices, and he likes the others based low P/Es. Others too... "Bulls make money, bears make money, pigs get slaughtered." Before I go with this weekend's Barron's, please allow me a comment or two on LAST WEEK'S. The Cover Story last week was Kopin Tan's piece "Made in America". He makes the case that manufacturing is coming back to America big time. US companies Caterpillar, Apple (AAPL), Ford (F), General Electric (GE) and Whirlpool (WHR) are making more here in the USA. And that foreign companies Toyota (TM), Airbus SAS and Samsung Electronics (005930.Korea) will be building plants here in the US. Samsung will spend $4 billion for a semiconductor plant in Texas. "Barron's" identified eight companies that should prosper here according to Tan. I would guess that since he chose these eight from eight different industries, that this list is just "representative", and if he is right about a manufacturing renaissance in the USA, then there are many others that could be just as good. The theme Mr. Tan pushes is that abundant and cheap NatGas will bring us lots of jobs and lots of manufacturing. "So the next time you hear an economist bellyaching that there's no inflation, ask with proper incredulity if he ever bothered to glance at the trajectory of the price of a Super Bowl ticket." Abelson goes on to finish with an extended look at recent numbers. In short, there seems to be slow, very slow, growth in economic indicators. Very disappointing vs. past recoveries. "You might say risk isn't as risky, and safe isn't as safe." If stocks are heading up, in other words, cyclical may be the way to go. Reshma Kapadia writes a bullish piece on Tata Motors, the owner of Jaguar and Land Rover. Tata is perhaps also well known as the Indian car maker that makes the Nano, the world's cheapest car (of, Reshma, you did not mention its cost!). Alexander Eule writes an interesting (and bullish) article on SanDisk (SNDK). SNDK's flash drives are now being bought in larger quantity by Apple (who wants to lessen their dependence on arch-rival Samsung). Flash drive technology ("NAND") has been coming down in cost for years, but it llooks like SNDK and their rivals Samsung, Micron (U) and SK Hynix (0660.Korea). SNDK is the ONLY pure play though. (Some of my thumb drives come from CHINA, I wonder if China makes the "NAND" technology, or do they just buy the chips from the above four and assemble the rest there in China...). David Englander writes a bullish piece on GulfMark Offshore (GLF), a provider of boats needed by offshore drillers. Offshore drillers have a large need for such "work boats" -- I briefly worked in the oilfield services businesses and had the "pleasure" of riding work boats to and from offshore rigs --, and GLF provides a lot of various specialized boats, and has the youngest and highest quality fleet. GLF has fleets in the North Sea and Southeast Asia as well as the Americas. Hey, maybe so! These boats ARE vital to getting the work (offshore drilling) done. Jim McTague ("D. C. Current") writes about "the smartest guy in American politics,"... And who IS this "smartest guy"? Governor Jerry Brown! And who called him the smartest guy? Vice President Joe Biden! Well, California... You got what you asked for! President Obama and Governor Brown! Gene Epstein ("Economic Beat") writes that there has been confusion in spending on defense. There were reports that defense would be cut 22%, that it was already cut, etc. Well, no. The actual cut seems to have been 3.1%, and that helped push GDP into that -0.1% last quarter. The article is a bit confusing because what the government publishes is confusing. But, Epstein points to some small, more recent gains in the private sector and a cut in government employment. All of this fits two memes I have long noted: that government spending is a huge yet slippery concept and that our recovery since the Great Recession has been very slow compared to most recoveries in the past from recessions. "Other Voices" (Barron's occasional column written by people not employed by them) is written by Milton Ezrati. The author hopes to show that the Fed can help prevent booms & busts by "sterilizing" excess inflows and outflows of liquidity from overseas. I am oversimplifying..., but it is the nature of my Reviews to simplify. The Fed ought to involve itself EVEN MORE in economic policy? Ahh... Ahh, no, IMO. Immigration reform is a tough and difficult issue, but at some point we have to resolve this in a positive manner, that is, HAVE an explicit policy and stick to it. 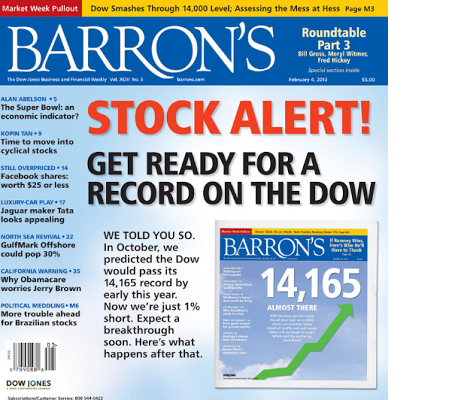 Barron's has been running their "Roundtable" in three parts. I covered Part I two weeks ago. Since I was unable to review Barron's last week, I will look at the comments and stock picks of the investment pros for both weeks now. Hankook Tire Worldwide (000240.Korea) <--- ! Hey! It's Half Time at the Super Bowl, and HALF of the Superdome just lost power! Call GE! Pimco Total Return (BOND) <--- talking his book? Bonds? Pimco Corporate and Income Opportunity (PTY) <--- talking his book? Assif Shameen ("Asian Trader") notes that Tokyo's Nikkei is up 20% (in Yen) while the Yen has fallen 14% vs. the dollar (since late November). There is an ETF that buys Japanese stocks yet hedges out the Yen exposure (the problem is that I could not find the ticker just now on Google, but it is advertised all the time on CNBC...). He is bullish on Japan. Ben Levisohn ("Emerging Markets") writes that although Brazil gained 101% last year (less than the S&P 500) that he expects this year to underperform as well. Why? Government meddling. Again. Example? Petrobras (PBR, which ought to be a great stock, I know someone who sells capital goods to PBR, he tells me that the company itself is excellent with good engineers) is being meddled with, again. "European Trader" author Jonathan Buck writes about the two flavors of Heineken... The holding company is at a larger than normal 17% vs. Heineken itself. Alexandra Wexler ("Commodities Corner") writes that sugar may be affected by changes in the Brazilian and US markets for ethanol. Our EPA just mandated that more "advanced" ethanol must be used in gasoline/ethanol blends. And US corn ethanol does not count as "advanced", perhaps because ethanol from sugar burns more cleanly. Michael Aneiro ("Current Yield") writes that even bond gurus are having trouble finding worthwhile bond investments. One sector that seems to be gaining traction is the corporate bonds sector, this would include junk bonds. Bonds from companies in the housing and energy sectors are getting a bid. Aneiro notes that for the first time in a while the yield on the 10-Year note is (a hair over) 2%. Multiple insiders sold shares in several companies, but only the NINE insiders at American Express (AXP) sold a TOTAL of over $30 million. The Mighty Peruvian Sol finally has declined vs. the US dollar due (I presume) to the Peruvian Central Bank weakening its currency, last week it lost 1.0%. 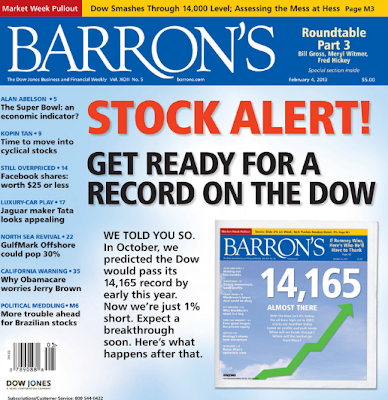 Verdict: I am really curious to see if Mish is right about the Barron's cover being a contrary indicator! Fertilizer in simple words is a substance organic or chemical in nature that is added to soil to increase and intensify its fertility by supplying one or more nutrients essential for the growth of plants / crops. The crops are heavily dependent upon the above materials attributing about 50 % of the yield to these fertilizers. If the yields increase, the farms will make greater profits and this fact sums up a direct positive co relation.